Artemia Shelless Shrimp Eggs are a speciality aquarium treat for all fish, containing a nutritionally balanced blend of minerals and vitamins to supplement your fishes' daily diet. 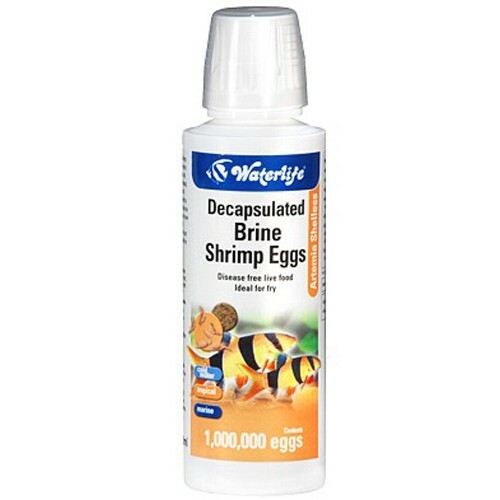 The eggs are suitable for even juvenile fish consumption and offer as much nutrition as hatched adult shrimp. The decapsulation process they go through means they are free of all disease organisms and parasites. Suitable for use in all saltwater, tropical freshwater and cold water aquariums. There are currently no questions for Waterlife Artemia Shelless Brine Shrimp Eggs Fish Food - be the first to ask one!